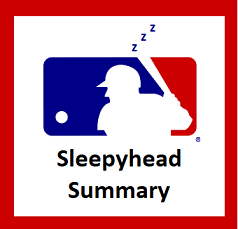 The MLB Sleepyhead Summary is a new regular column that helps British baseball fans keep up to speed with MLB despite the time difference! The Minnesota Twins started last season by losing their first nine games. An 0-9 start isn’t much fun for anyone, but when you have the word ‘wins’ in your nickname, you’re going to hear about it even more than most. They briefly responded to the jeers by reeling off four consecutive wins, but that’s where the comeback ended. 2016 was a miserable year for Minnesota as the team ended up with a 59-103 record, the worst in all of MLB. Unsurprisingly, expectations were not exactly high for the Twins to mount a play-off challenge in 2017, yet they continue to confound the naysayers as we head into the last two weeks of August. The Twins have won 11 of their last 13 games, including a sweep over the Arizona Diamondbacks this past weekend (Sunday’s win driven by a nine-run first inning), to draw themselves level with the LA Angels for the second Wild Card spot. Baseball Prospectus currently gives them a 33.4% chance of making it to the post-season, which would be a fantastic story if they can pull it off. Minnesota have a chance to earn some wins this week at the expense of the AL’s worst team. They have a five-game series away to the Chicago White Sox, beginning with a double-header on Monday, and if they can build on their 7-4 season record so far this season against the Sox they could start to win over even more of the non-believers. The Angels beat Wild Card rivals the Baltimore Orioles 2-1 in this weekend’s series, with the Orioles’ sole win being powered by the outstanding individual player performance of the weekend. Manny Machado launched three home-runs, the final one being the small matter of a walk-off grand slam, in a thrilling 9-7 victory. The Angels move on to a four-game series against rivals the Texas Rangers, whilst the Orioles look to gain back some ground in a home series against the Oakland A’s. Elsewhere in the AL, the Boston Red Sox – fresh off a series victory against the New York Yankees – have a potential play-off preview four-game series against the Cleveland Indians, whilst those Yankees have a three-game set against Detroit. Seattle and Kansas City will both look to gain ground in the AL Wild Card race by picking up some wins against National League opposition. The Mariners continue their road trip with a visit to Atlanta, whilst the Royals are hosting the Rockies for three games starting on Tuesday. In the National League, the Pittsburgh Pirates have the tough task of facing the LA Dodgers four times across Monday to Thursday. The Buccos are now six games back in the NL Central having recovered from a six-game losing streak to win the final two games of their series against the St Louis Cardinals. They need to keep on picking up some wins and that’s not something any team has found easy against the Dodgers this season. The Cubs and Reds split a four-game series last week and meet up again, this time in Cincinnati, for another three games from Tuesday to Thursday. Meanwhile the Cardinals are hosting the Padres for three games at Busch Stadium and the Milwaukee Brewers are in San Francisco taking on the Giants. The Brew Crew won two of three at Coors Field against the Colorado Rockies this past weekend and, coupled with the Twins’ sweep of the D-Backs, the play-off picture in the National League is potentially changing. Whereas even just a week ago it looked like the NL Central teams were battling for one play-off spot, Arizona now only has a 2.5 game gap over Milwaukee for the second Wild Card, with the Rockies one game further ahead. This means that although the Cubs earned back a small gap at the top of the NL Central thanks to their weekend sweep of the Toronto Blue Jays, the Brewers, Cardinals and possibly even the Pirates might have a second chance at making the post-season aside from clawing back the gap at the top of their own division.